In explaining the eshaku (会釈), meaning a greeting or salutation, Ono uses the kanji for folding one's arms (拱手) but then glosses it with the furigana for eshaku (えしゃく). 老松　[ろうしょう]　Rou Shou, lit. "old pine"
馬面　[ばめん]　bamen, lit. 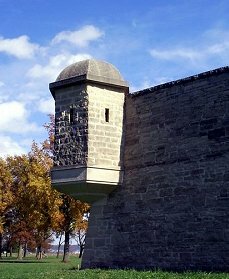 "horse face"; a fortification projecting outward from a castle wall or ramparts. After the deployment of heavy siege cannon, bastions were constructed as large, defensive earthworks. 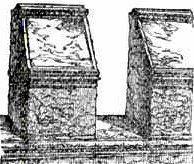 Merlons along a parapet wall. From within the throngs, and old man turned to her and held up his hand. should be "an old man". if you watch chinese historical or martial arts media (tv, movies, etc. ), you'll inevitably see them 拱手. it's when one cups their right fist in their left hand (thumbs facing the person to whom they belong) and holds it in front of them in greeting. people say that it's symbolic of one covering up their weapon hand as a way to say, "hey, i'm not going to stab you." Chapter 50, pg 114: "The refugees had built themselves a village in the vacant land that one good gust of wind would blow all to kingdom come." I'm not sure what you mean with "...one good gust of wind would blow all to kingdom come." Page 114 corrected: The overflowing tide of people, their faces glum and ragged, flowed right up to the gates. The refugees had built themselves a village on the vacant land. But it looked like one strong gust of wind would sweep it all away.